Excellent lifetime cost compared to other tubing options. Typically 15% cheaper than 6Mo Steel and Super Duplex Stainless tubing. Tungum Tubing has been used for high quality safety critical applications for over 30 years. 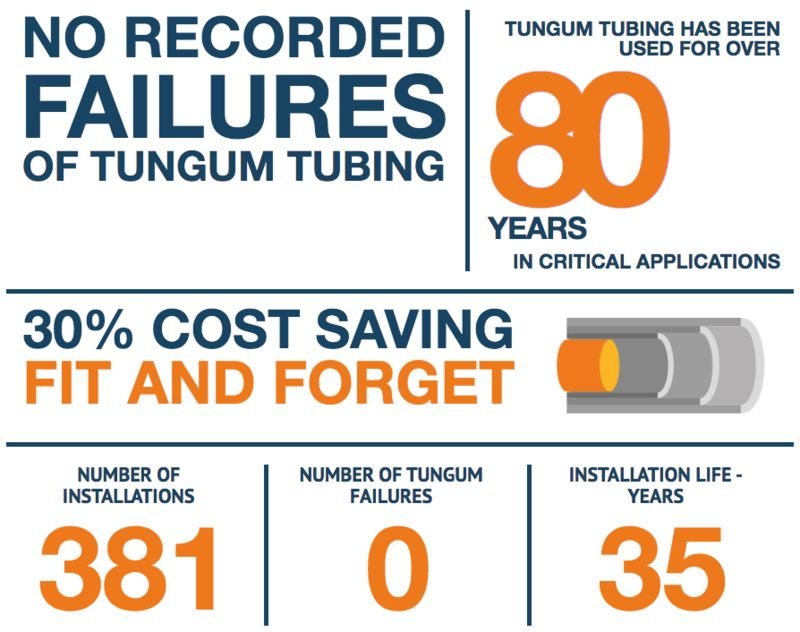 In fact, there are no recorded failures of Tungum Tubing when correctly used and installed. That is why we use the expression ‘fit and forget’ due to its long life and excellent corrosion resistance. Tungum alloy possesses a natural protection mechanism whereby, on exposure to atmosphere, a very thin oxide coating is generated, no more than two thousandths of an inch thick. The tube becomes discoloured, it may even have a verdigris coating, but under the oxide layer the tube material is perfect and will remain so for a very long time. Tungum has been in use offshore since 1978 and industry awareness of its superiority for use in marine environments is increasingly evident.